Developed by Platinum (Bayonetta, Vanquish) and Konami and published by Konami. You’re a cyborg ninja that can precision slice dudes, ladies, and robots alike into tiny pieces with the quickness. Developed by Ninja Theory (Heavenly Sword, Enslaved) and published by Capcom. Lot of drama around this release since Dante’s hair is black and its a re-imaging. A whole lot of good reviews so far and a soundtrack by Combichrist make this game sound pretty appetizing. If you aren’t familiar with the Devil May Cry franchise, its the series God of War based its combat, mechanics, leveling up, and weapons on. Ninja Theory proved they make these kinds of games pretty good with Heavenly Sword and the proved they could do story and characters with Enslaved. Personally, I can’t wait to play it but I have to because I’m broke. Developed by Platinum (Bayonetta, Vanquish) and published by Sega. Anarchy Reigns comes in new at $30 and is a beat ’em up multiplayer game featuring 16 characters with Bayonetta as a promised DLC and packaged with Jack from Wii’s Mad World. There’s a pretty chance you already know if you want this or not. 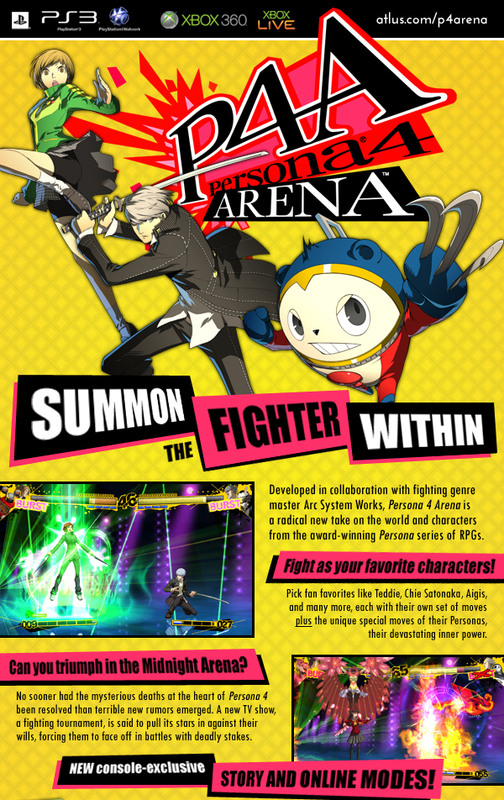 Developed by Arc System Works (BlazBlue, Guilty Gear) and published by Atlus (Persona, Shin Megami Tensei). This is the anime style 2D fighter based on everyone’s (if you aren’t everyone then yes this is a threat) favorite school going, demon hunting JRPG series Persona. Featuring characters from Persona 3 and 4, the story mode is allegedly 40 h0urs long (so probably 5-7 hours per character if you win the first time). The game looks pretty slick and allegedly doesn’t have any moves harder than a half circle. Color me excited. Developed by Grasshopper (Shadows of the Damned, No More Heroes, Killer 7) and published by Warner Brothers of all companies. Truth be told, I can see a lot of people being turned off by a scantily clad female protagonist. But being as this is a Grasshopper release, its guaranteed to be absolutely insane. And from the looks of the trailers, its going to be bloody and ridiculous. Your boyfriend is a head you carry around and you’re a scantily clad cheerleader chainsawing zombies. How you react to that sentence is probably about all that’s needed to know. Also Jimmy Urine, the vocalist for Mindless Self Indulgence, seems to have worked with Akira Yamaoka on the soundtrack. I’ll let the graphic speak for itself although wasn’t this supposed to be on Vita too? Developed by CyberConnect2 (they did a metric TON of dot Hack and Naruto games) and published by Capcom. To be clear we’re not clear at all on this title, and we understand most of the Shin Megam Tensei games. So Asura is accused of murdering the Emperor and his wife is captured and there’s something about Mithra and Deus and then there’s a giant finger attacking the planet that is god or something and he explodes when you punch him in the finger. See, English doesn’t even work when describing this game. Be warned, QTE’s are abundant. Developed by Starbreeze (The Chronicles of Riddick, The Darkness) and published by EA. This is a new take on the old classic Syndicate Wars franchise Peter Molyneux is often credited for. The original series was about taking four agents, replacing their body parts with cybernetics, pumping them full of drugs, and taking over the world in a violent, mind controlling fashion. The new version appear to have taken this ruthless logic and applied it to an FPS. Now with dubstep. Developed by Big Huge Games and 38 Studios and published by EA and 38 Studios. Reckoning is a stylized open world RPG romp featuring writing by R.A. Salvatore, best known for his work on AD&D Forgotten Realms novels including the creation of fan favorite Drizzt Do’Urden, as well as art design by Todd McFarlane (Spawn). Developed by Obsidian and published by Bethesda. Obsidian took what Bethesda did with Fallout 3 and turned it on its head creating a crazy world of consequence with no black and white path to victory. This version includes all the DLC. Developed by Digital Extremes and published by 2K. Digital Extremes has developed and co-developed such legendary titles as Bioshock and Unreal as well as the cult favorite Dark Sector. Darkness 2 is based off of the comic license from Image Comics. The game protagonist Jackie Estacado is basically the middle of a mob war as he possesses the demonic darkness, who is voiced by Mike Patton (Mr Bungle, Faith No More, The Fantomas, the angry personality orb from the first Portal, the creatures from I Am legend, zombies in Left 4 Dead, no I’m not a fan <-sarcasm <-professional journalistic writing). The game itself is a first person shooter enhanced by darkness powers including ripping off car doors and using them as shields, creating minions, eating people for health, things like that. Developed by Rebellion Developments (Lots of Alien vs Predator games) and published by Konami. Neverdead is a third person action game with puzzle elements and that is about the only normal thing I can write about this game. The main character can’t die but can be dismembered so at some point the player is going to be rolling around his head looking for the old body parts. Developed by Double Fine Productions and published by Microsoft. Rise of the Martian Bear is the DLC for the Iron Brigade (formerly known as Trenched). Normally we don’t plug DLC on here but this one seemed like it was going under the radar and Double Fine usually deserves your attention. Plus mechs.